Fender Musicmaster Bass Model Solid Body Electric Bass Guitar (1972), made in Fullerton, California, serial # 315812, Sonic Blue finish, alder body, maple neck with rosewood fingerboard, original black chipboard case. Overall length is 42 1/8 in. (107 cm. ), 12 1/4 in. (31.1 cm.) wide at lower bout, and 1 1/2 in. (3.8 cm.) in depth, measured at side of rim. Scale length is 30 in. (762 mm.). Width of nut is 1 5/8 in. (41 mm.). This is a clean and original early 1970s Fender Musicmaster bass, with just some light finish wear but no repairs or alterations. There is some light overall finish wear and a couple of small marks in the top that look like the beginnings of thumbrest holes that were never drilled. The lower tip of the pickguard by the jack has chipped off, but it is still held securely. This lovely aqua blue body finish is actually the pre-CBS style Sonic Blue, with a light lacquer overcoat, so it has ambered nicely. Due to its budget status, the Musicmaster had not yet received the "upgraded" heavy Polyester finish, and the neck is finished in thin lacquer as well. 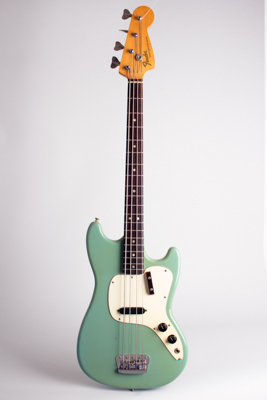 This bass actually looks and feels like an earlier 1960s, and plays just great and sounds as it should. The Musicmaster still one of the best beginner's basses ever made, and a very comfortable 4-string quite suitable for live and recording situations despite its budget origins. Excellent - Condition.